The root of the perennial herbaceous plant Astragalus membranaceus (Fisch.) Bge. var. mongholicus (Bge.) Hsiao or A. membranaceus (Fisch.) Bge. of family Leguminosae. Mainly produced in Inner Mongolia Autonomous Region, Shanxi and Heilongjiang provinces in China. The one produced in Inner Mongolia Autonomous Region is better. Slight smell and sweet, with legumes flavor when chewed. Coarse and straight long root, white-yellow cross section, rich powder, sweet. Sliced, unprocessed or stir-baked with honey. Tonify qi, raise yang, tonify defensive aspect to secure superficial, relieve edema through diuretic, dispel toxin to promote skin generation, nourish blood. It is indicated for chronic cough and dyspnea, shortness of breath and mental fatigue due to lung deficiency, because it can tonify lung qi. Because it can not relieve cough and dyspnea, it needs to be combined with cough and dyspnea-relieving and phlegm-dispelling herbs, such as Zi Wan, Kuan Dong Hua and Xing Ren. For chronic cough and dyspnea, shortness of breath and mental fatigue due to lung and kidney deficiency, it is combined with lung and kidney tonics, qi reception-improving and dyspnea-relieving herbs, such as Ren Shen and Ge Jie. It is a key herb for edema, little urine due to spleen deficiency, dysfunction of transportation, water-dampness stagnation, because it can tonify qi, induce diuresis and alleviate edema. It is commonly combined with spleen tonics, edema-alleviating diuretics. For instance, it is used with Bai Zhu, Fu Ling and Fang Ji in Fang Ji Huang Qi Tang from Jin Kui Yao Lue. It is commended as "the most effective herb for sores and ulcers" because it can dispel toxin to promote skin generation through tonifying qi and blood. It is indicated for middle and latter stage of sores and ulcers. For middle stage of the disease, sores and ulcers difficult in rupture due to qi deficiency with excessive pathogen-toxin which cannot be dispelled; it is commonly combined with qi and blood tonics, heat-toxin-clearing and pus-dispelling herbs. For instance, it is used with Ren Shen, Dang Gui, Sheng Ma and Bai Zhi in Tuo Li Xiao Du San from Yi Zong Jin Jian. For latter stage, ruptured ulcers incurable due to qi and blood deficiency though pathogen-toxin being removed, it is combined with qi and blood tonics, vessels warming and activating herbs. For instance, it is used with Ren Shen, Dang Gui and Rou Gui in Shi Quan Da Bu Tang from He Ji Ju Fang. 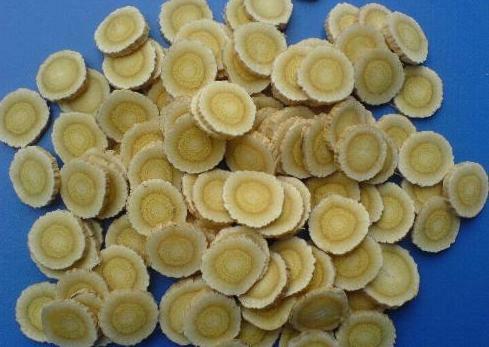 Besides, it is indicated for qi deficiency and blood deficiency, hemiplegia, sequela of wind-stroke because it not only activates blood through promoting flow of qi, but also activates blood directly, and it is combined with blood-activating and meridian-smoothing herbs. For instance, it is used with Dang Gui, Chuan Xiong and Di Long in Bu Yang Huai Wu Tang from Yi Lin Gai Cuo. In addition, it can be used for wind, cold and damp arthralgia, chest pain through combinations. Decoct 10~15g, 30~60g for large dosage, stir-baked with honey for tonifying qi. It is contraindicated in cases of exterior excess with excessive pathogen, internal obstruction, yin deficiency with yang hyperactivity, early stage of sores and ulcers of excessive pathogen and no deficiency of heathy qi, because it can tonify qi, raise yang and strengthen superficial.